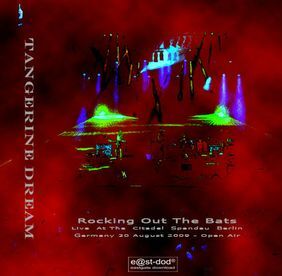 Under the slogan "Rocking Out The Bats" Tangerine Dream performed an open air concert in Berlin on August 30th, 2009. The concert was part of the "Citadel Music Festival". 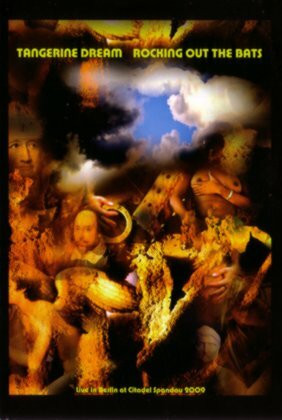 In late October the complete recording of the concert was released as an official download from the Tangerine Dream website. The Tangerine Dream Download shop about the download release "The 'Rocking Out The Bats Concert' in Northern Berlin at the historic site Citadel Spandau was the final concert on the occasion of the Citadel Festival 2009. The promoter considered it as a crowning closing of the very popular open air festival. Indeed it was a concert in a typical Berlin atmosphere with a partly hippiesque and very relaxed audience. Unfortunately TD were surprised by strict curfew regulations (they weren't informed before), so they got no chance to perform two more encores with tracks they never played live before -- that's the way it is in Berlin... The protected rare little bats residing in the old Citadel had to go to bed in time...!!" In December 2009 the concert was released on DVD. The package includes a four page booklet with 19 photos from the venue and the credits. The DVD menu provides the options to play the complete concert as well as to start from individual tracks, to view the credits or the three bonus features, and to do the audio setup (Stereo 2.0 or Dolby Surround 5.1). The Eastgate Music Shop about the DVD release "A beautiful warm late summer night it was when five musicians started one of their maybe most remarkable outdoor concerts in the City of Berlin. The so-called 'Zitadelle' in the Spandau district of Berlin is more than historic in many ways. Apart from the political heritage and burdens it is also the home of thousands of bats -- one of the largest community of these creatures in Europe. Within the very old walls and niches of the building they live a very WWF protected life. Therefore the band had to accept a curfew by 10 pm which was rather sad because they had a lot more to say musically. But nevertheless it has been a breathtaking event for those who could attend. On this DVD you will see the whole show and some extras behind the scenes, sometimes with a laugh and sometimes with an ironic attitude. So enjoy a warm summer night's show on a cold midwinter night. :-)"